Claude is a small dog. Claude is a small plump dog. 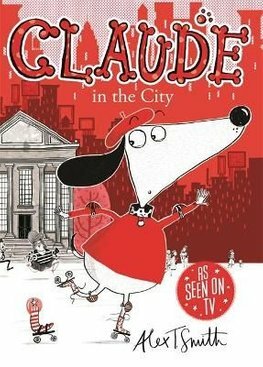 Claude is a small, plump dog who wears a beret and a lovely red jumper. Claude lives in a house with Mr and Mrs Shinyshoes. There is a real charm to this little series with its quirky illustrations and storylines and a rather Parisian air. (Yes, quirky can be code for irritating, but here it works!) This installment is a story in two parts, or possibly two separate stories. In Part I, Claude takes a trip to the city, where he visits a museum and inadvertently foils a major art robbery. In Part II, Sir Bobblysock gets poorly so Claude rushes him to hospital by rollerskate making “woo woo!” noises. There, he is mistaken for a doctor and once again saves the day by correctly diagnosing the mystery illness afflicting all the patients. There are plenty of silly names (Dr Ivan Achinbum, for example) and a lightly flippant tone that makes it fun to read aloud. It’s also ideal for early readers as it’s chapter book sized but without a daunting number of words per page – perfect for fils cadet, whose attention span is out of whack with his reading ability! The humour is nicely pitched to keep them hooked and there’s plenty to spot in the pictures too, which are all done in black, white and red but crammed with detail. We’ll definitely be keeping an eye out for the rest of the series. This entry was posted in Books, Children's Books, Reading, Reviews and tagged Alex T Smith, books, Children, Children's literature, Claude, Claude in the CIty, dogs, early readers, funny books, Hodder, illustration, learning to read, literacy, picture books, reading, recent reads, recommendations, reviews. Bookmark the permalink.